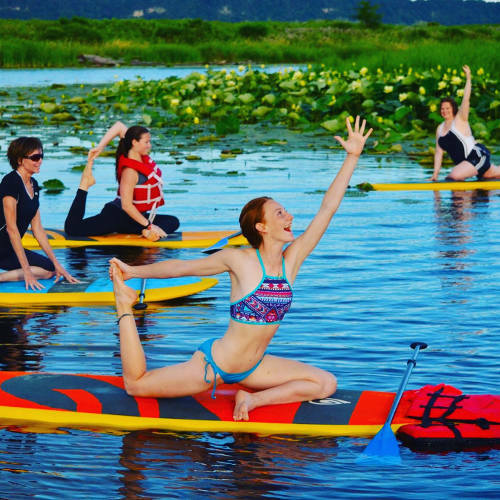 Iowa and stand-up paddleboard yoga seem like unlikely mates. Landlocked and known for our fields, we’re not the first state that comes to mind for water sports. But a quick search and a couple of phone calls, and I had more SUP yoga options to choose from than Hawkeye apparel on game day! I talked to instructors from Okoboji to Dubuque about getting beginners on the board. Amanda Jorgensen, owner of The Studio Yoga and Barre in Spencer, Iowa, says you don’t need to have paddleboard or yoga experience to join her class. In fact, it’s a low-impact form of exercise that calms the mind and teaches the importance of breath, simply by linking your boards together on the water and playing with poses. 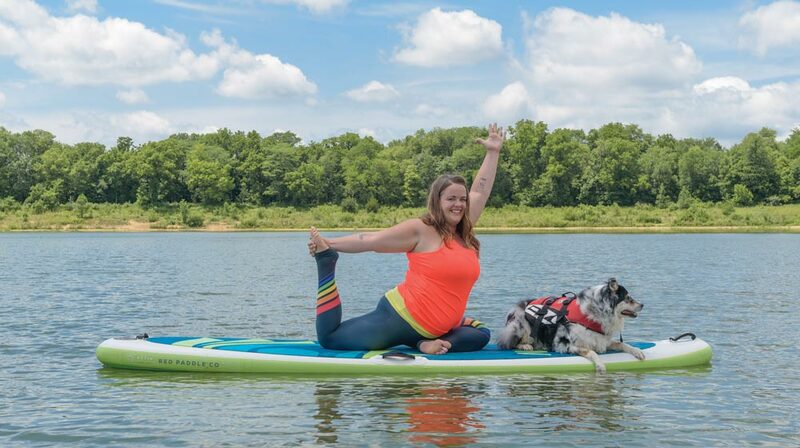 “I have a sign in my kitchen that says ‘What is it you plan to do with your one wild and precious life?’ So, if you love yoga, sunshine and West Lake Okoboji, this would be an exciting new way for you to exercise while enjoying the beauty of nature! It will benefit your strength and balance, while nourishing your soul,” Jorgensen said. Meg Rima, owner of Ignite Power Yoga in Dubuque, agrees. Teaching SUP yoga for five years, she’s witnessed the transformative properties of flotation. Rima said the practice has more than physical benefit. Her students often find a better connection and appreciation for the outdoors. SUP yoga may also serve as a bonding experience between students, both those who know each other and those just meeting. As I thought back to my first SUP yoga experience, these two elements were very potent. I also felt the gentle waves lured me deeper into the present and focused my mind. Some in my group even felt an emotional and spiritual response. There was something for everyone. Rima says she doesn’t rush students off after class, but rather gives them time to explore on their own and play. So like any good yoga class, you can find the element of your practice that nourishes you most. Linsey Birusingh, 500 RYT, leads retreats and adventures through her company, Yoga Thrill Adventures. She also teaches at Power Life Yoga and guides trauma-sensitive yoga for women around Des Moines. Off the mat, she is a journalist, TV host, traveler, adventurer, mother and wife. This article was originally published in YogaIowa’s Summer 2018 issue.